What Are the Use Cases for CouchDB? CouchDB is suitable for applications with accumulating, occasionally changing data with pre-defined queries. NoSQL is bad to anyone starting. But SQL not required for certain applications, such as writing log files. MySQL of course powerful but the features and power not exactly suitable with the need of mobile aplications, data analytics, some web applications. MySQL is practical for WordPress like web software where variety of tables, columns required to prevent from becoming messy. NoSQL in is a hard concept to grasp. Before SQL there was flat file and file-base systems. NoSQL partly of that flat-file origin. Why in the world would we would use CouchDB, Cloudant? Honestly, because there is no other choice. Cloudant is IBM-branded CouchDB, itself a document store with similarities to MongoDB. As they are JSON/BSON based stores, they don’t have very good support for in-database analytics. Fauxton is the official dashboard for CouchDB and is compatible. CouchDB can serve a purpose, sync, understandable, lot of peoples use it. You can’t think like SQL base systems in NoSQL. NoSQL systems can be used in conjunction with other systems. Unlike SQL you think that you will put all your data in 1 data store. couchDB is like an API from the start which saves ton of time. If you want to store User settings for an app, which rarely changes, MySQL is too much and CouchDB is just great. In the same way, To-do app or list of items, Comments & Replies on blogs, Service logs, Data from instruments and/or GPS are enough good use-cases for CouchDB. Good use of CouchDB and other NoSQL repositories is for synchronizing data in an occasionally connected which makes sense in industries like finance, data collection, log analysis, IoT fields. The model is also beneficial for companies that have a distributed workforce like real estate or construction. High velocity log writes, high performance caching are well suited situations for CouchDB. Document data stores such as CouchDB is closest to relational databases and provide a JSON data structure with all the fields presented hierarchically which avoids having to do table joins. Too large data will need Cassandra, which is built to support clustering. CouchDB manages a collection of JSON documents which are organised via and views are defined with aggregate functions and filters are computed in parallel, much like MapReduce. This Article Has Been Shared 1146 Times! How MySQL Used in Big Data Analysis? MySQL used with Hadoop, where output being stored on the MySQL server. MySQL itself can be used as a big data store. Here Are the Steps on How Install Apache Cassandra on Ubuntu Single Cloud Server Instance. Cassandra is a distributed wide column store NoSQL DBS. 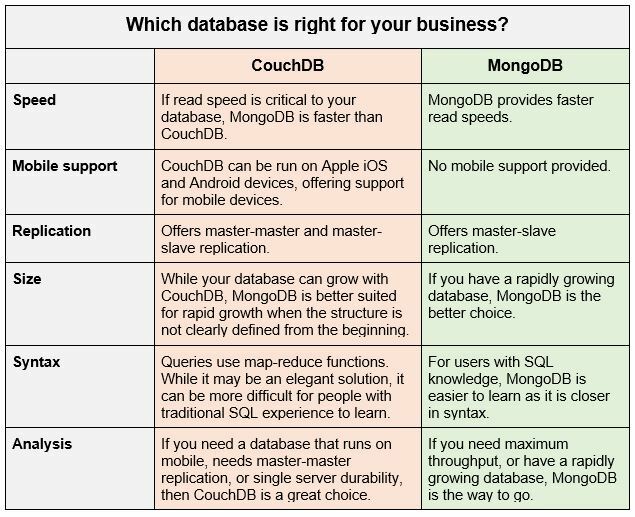 Cite this article as: Abhishek Ghosh, "What Are the Use Cases for CouchDB," in The Customize Windows, March 24, 2019, April 18, 2019, https://thecustomizewindows.com/2019/03/what-ae-the-use-cases-for-couchdb/.